People do business with people they know. 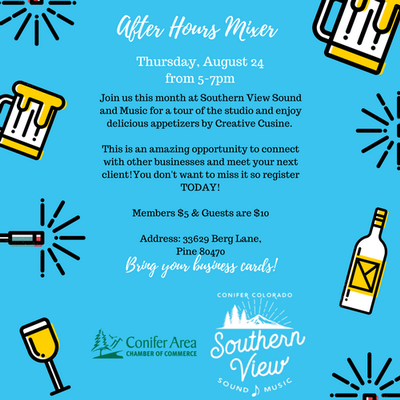 Build your network and join us for the monthly After Hours Mixer at Southern View Sound and Music. Stop by for a tour of Paul's recording studio and enjoy appetizers from Creative Cuisine. Don't miss this mixer, you're in for a treat! Enjoy an evening of networking, drinks, appetizers and get to know your next client. Not a chamber member yet? This is a great way to learn more about how the chamber can help you grow your business. Contact the office for more details. 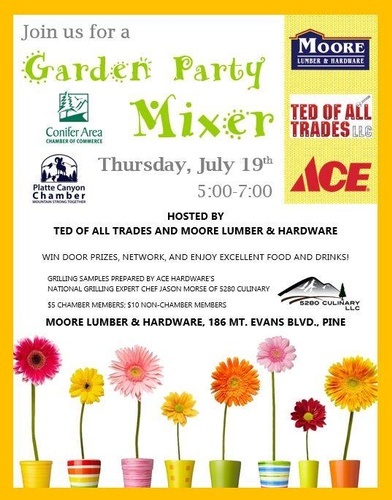 If you are interested in hosting or sponsoring an After Hours Mixer, please contact Melanie at director@goconifer.com or call the office at 303-838-5711.